We all want the best for our families and being healthy and active is part of that. So, we’ve developed a huge range activities that you can all enjoy together in our clubs. Whether you’re our youngest member or our oldest, our activities, social calendars and cafebars will have something for everyone to enjoy. And, if you’re looking for something to keep the kids happy, then we have plenty of activities for them to try. Plus we’re experts at throwing a perfect birthday party! So, when you want to relax, have fun and enjoy some quality family time, we’ve got everything covered. Our cafebars aren’t just a place for eating fresh and tasty food, they’re a space you can relax, work, or chat to new friends. We have free Wi-Fi in all our clubs too, so if you need to get on with some work then you’re more than welcome to spend the day in the club. Time will fly when you spend the day in our clubs and with so much to do, kids just love it. There is plenty of choice – go swimming, play tennis, and then when you’re worn out refuel with a meal in our cafebars. And it’s not all about spending time togheter, our clubs allow your little ones to gain some independence too. Whilst they’re in a fun DL Kids class or activity, you can visit the spa or book onto a group class. And, we have full calendars of social events in the clubs meaning there is plenty to get involved with, kids entertainers, social evenings and coffee mornings, there is never a dull moment. 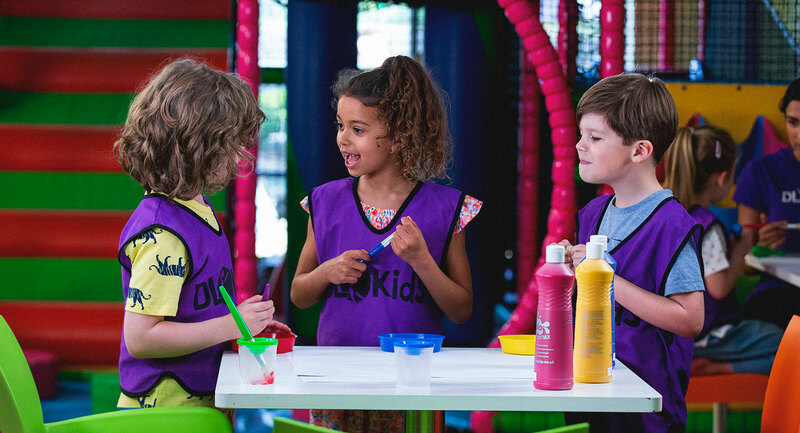 Our DL Kids programme is a great way to keep the kids active and have lots of fun all at the same time. What’s even better is that we deliberately time DL Kids sessions to match up with our group exercise classes, meaning you can enjoy the club, while they play a sport, some games, or have fun in an arts and crafts session. Our DL Kids session are not only a great way of keeping the kids running around, they will learn new skills and new sports, all whilst having fun and making new friends. It’s amazing what you learn through play, and that’s where it all starts for our youngest members in the crèche. Our qualified crèche staff love caring for small children, creating a happy place for them to have fun and learn all through playing. As well as this, our DL Kids sessions, plus Holiday Active programmes for the school breaks, there is plenty to do for our teenage members too. They can join some of our classes, stay fit and healthy in the gym, or challenge a friend to a tennis match. Kids parties can be tricky to organise, so why not leave it all to us. We do amazing themes, tasty party food, party bags and invitations, not forgetting lots of fun and games. All you need to do is turn up with the birthday child, some guests and cake. It’s not just birthdays – we also arrange special events for any occasion. You can celebrate Halloween, Easter and Christmas in the club too.